(Photo Credit: Esther Lin/SHOWTIME) By Joseph Herron: Like many great fighters of yesteryear, the boxing world has witnessed many great champions cultivated with a careful guiding hand. Most recently, the career of Canelo Alvarez’s famed promoter Oscar De La Hoya was nurtured cautiously by the vigilant eye of Hall of Fame matchmaker Bruce Trampler and Hall of Fame promoter Bob Arum. The Top Rank brass knew what they potentially had and elected to carefully navigate the Golden Boy’s career during the early stages of his rise to super stardom. Many ringside critics and boxing experts criticized the star-making machine, asserting that Oscar was a padded fighter who was purposely avoiding the stiffest competition available. Although the five division champion currently possesses great disdain for his former handler, De La Hoya has learned very important lessons from the masters at Top Rank and is utilizing the same promotional tactics to develop his WBC Junior Middleweight Champion. With a true architect of the sport like the great Don Chargin overseeing the 21 year old fighter’s career, Oscar has placed Alvarez in a position to succeed and possibly become the next big star of boxing. But with the green strap currently wrapped around his waist, the fight public has been demanding more from Canelo Alvarez. This Saturday night at the MGM Grand Garden Arena, the young champion will defend his title against the improbable former Junior Welterweight prospect Josesito Lopez. Although most pundits are shaking their heads at the fan friendly match-up, the Golden Boy brass are confident that their cautious efforts will generate another Canelo victory and an additional step toward the ultimate prize in boxing. But fight fans can be impatient and often brutal, dishing out verbal shots below the belt; especially when a title holder elects to evade the toughest fighters in the division. Are the boxing faithful justified in their harsh criticism of the young WBC Champion? Absolutely…but it doesn’t change the idea that Golden Boy is taking the correct approach when choosing the path for Canelo. Golden Boy is prepared to take the harsh words of skeptics if events play out as anticipated. The relatively new fight promoter can accept the occasional slanderous remark from the pugilistic critic. What they can’t accept at this juncture in Canelo’s career is a halting defeat. In boxing, most fighters and promoters agree that too much emphasis is placed on a single bad performance or untimely loss on a respective resume. But…it is what it is. Fight fans have been fanatical in praise and in censure since the sports conception. Do fans exaggerate a win or a loss too frequently? Absolutely. But is the boxing universe wrong in reacting this way? Nope. Fight fans love to dramatically assess a fighter’s achievements and failures. This is the single most important factor when propelling the sport. The fight fans’ passion has always been the fuel that drives the pugilist machine. Without the fervor and dedication of the die-hard fight fan, boxing as we know it would seize to exist. So Golden Boy ultimately loves the drama surrounding their fighter…even if many of the echoing voices are negative. A great number of boxing fans identify the massive money making potential of Saul Alvarez and have jumped on board the Canelo bandwagon. Alvarez has all of the tools to be a truly great fighter; mental and physical strength, power in both hands, and the ability to explode and close the show in style. Does Josesito have a real chance to pull off the shocking upset this Saturday night? It’s highly unlikely, but anything can happen in the ring on fight night. So Golden Boy’s primary objective at this stage in Canelo’s career is to reduce the overall percentage deviation as much as possible while keeping their fan-base entertained. Boxing fans are intelligent enough to understand the measures taken to cultivate Canelo Alvarez’s career, but it doesn’t mean they have to like it. 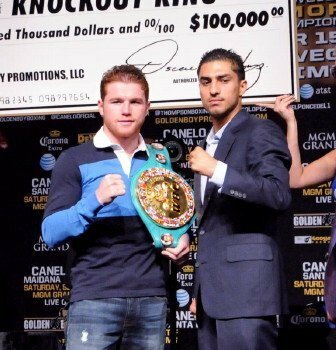 You are here: Home / Boxing News / Saul “Canelo” Alvarez: Should the boxing world judge slowly?